Fusion food keeps increasing in popularity, as korean tacos and sushi pizza pop up on more and more restaurant menus. But Stacy Labbs and Sherri Field put a new twist on fusion food. Both Labbs and Field are wine and liquor connoisseurs who fused (ha!) their interest with food and booze to produce Never Cook Sober. Stacy Labbs took a bartending class when she was twenty-one and, from there, began inventing recipes. Field is a homebrewer and wine maker who has a long-time appreciation for great spicy food. 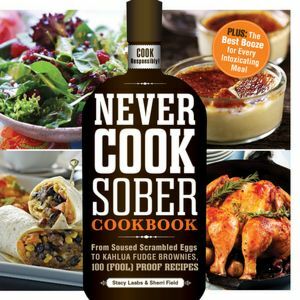 Unarguably, an interesting compilation of booze infused dishes, Never Cook Sober, includes recipes that range from Bourbon Vanilla French Toast to Bloody Mary Vodka Spaghetti. Recipes also include an alcohol content scale in the form of bottles of wine or beer. I was always under the impression that most of the alcohol content in food got burned off while cooking. I looked this up and found that it does depend of cooking method, but on average about 50% of the alcohol remains in the food. Finally, a suggested food and drink pairing accompanies each recipe. Well-chosen complementary flavors are definitely the key to making these recipes tasty at any time of day. For those who are brave enough infuse their food early in the day, some recipes to try out are Soused Scrambled Eggs with Champagne and Smoked Salmon and Tanked Cinnamon Whiskey and Brown Sugar Oatmeal. I was also very intrigued by many of the dessert recipes that include Happy Hour Buttered-Rum Apple Crisp and Kahlua Fudge Brownies. A must-have cookbook for any college student who wants to throw a popular fusion-food dinner party or make the occasional boozy treat. Zoe McKinnell is a senior at Brown University who loves reading new cookbooks and trying out fusion recipes. Preheat grill to medium heat. Mix olive oil, lime juice, tequila, and cilantro in a shallow bowl. Add the fish to the bowl. Marinate for 20 minutes. Lightly oil the grill to help keep the fish from sticking during grilling. Place fish on the grill and let cook for around 4 minutes over direct heat. Be careful not to burn. Flip the fish and let grill for 1 minute. Make sure the fish is cooked thoroughly. Let the fish rest for about 5 minutes. Flake the fish into pieces. Place fish pieces in corn tortillas. Add garnishes to taste. The bloody mary vodka spaghetti sounds like it will be a divine dish!! !